Sewer camera inspections offer both you and your plumber an inside view of your pipes for a distinct and easy diagnosis. Sewer camera inspections can be particularly valuable for homeowners as they provide an honest reflection of what’s going on inside your sewers without having to rely on your plumber’s guesses. Sewer camera inspections can find clogs, broken pipes, partial pipe build up and tree root infiltration. All homes can benefit from a sewer camera inspection, so how do you know if you need one? Moving into a new home is the perfect time to conduct a sewer camera inspection. After all, you’ve inspected every other part of the home shouldn’t you look underground in the pipes before you buy? Just before you purchase or before you move in, is the ideal time to conduct a sewer camera inspection. Sewer inspections are particularly necessary if you’re buying an older home or a home that’s surrounded by a lot of trees. Experiencing sewage back up or clogged pipes soon after moving into a new house can be alarming. Avoid this scenario by booking a sewer camera inspection before you buy or before you move in. Is water pooling in the bottom of your shower? The kitchen sink taking longer to drain? Is the toilet constantly getting clogged? While you might pass these off as usual symptoms of an older plumbing system, drains that are often slow or blocked warrant further investigation. A sewer camera inspection allows you to get an inside look so you can analyze what’s at the core of your blocked or slow drains and apply the appropriate fix. Issues with water pressure can cause unsatisfying showers and frustrating problems with dishwashers and washing machines. But, did you know that matters with your sewer line can cause pressure problems? While a leaky pipe causing low pressure can be easier to find, a leaky sewer pipe is not. This is where a sewer camera inspection can come in handy to give you an insider view of the sewer pipe and any potential leaks that may be causing decreases or fluctuations in water pressure. Foundation leaks can be notoriously tricky to diagnose and require a lot of expense to correct. A leak under the foundation is often found to be caused by the sewer line – but you don’t want to dig up your sewer pipes and foundation to find out where the leak is. A sewer video inspection can often help pinpoint and identify the source of the leak quickly and efficiently, potentially saving you money on unnecessary excavations. Sewer repairs and replacements can be very costly, often running into the thousands of dollars. Preventative sewer video inspections can help ensure your sewers are whole and intact condition free from clogs, build up, and tree roots, and likely to keep helping you in the future. A regular inspection keeps your sewer healthy and avoids exorbitant repair expense. 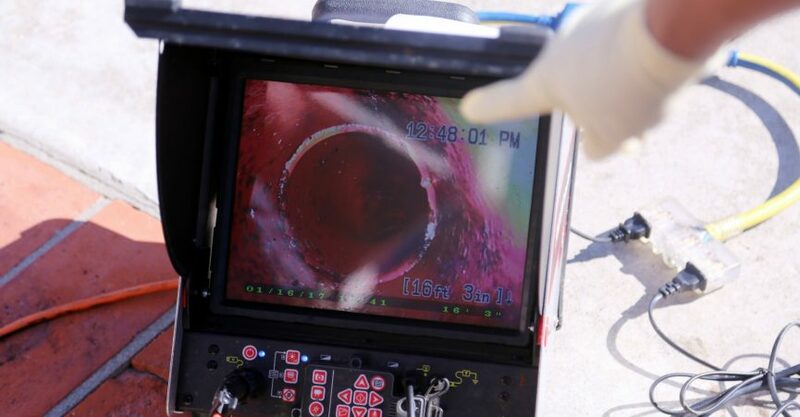 >>To Learn More About Sewer Camera Inspections Contact Us Now! Sewer camera inspections can be enormously useful by giving you an inside view of your pipes so you can choose the best care and maintenance for your plumbing. I never knew that it is advisable to get the sewer inspected by a camera when the drains are slow to go down. As you mentioned, it can help identify the main cause of the problem as to why it is clogged. I might have to contact an inspector first thing in the morning tomorrow because our sink in our dirty kitchen is having a problem from time to time. The water doesn’t go down at times, and it is frustrating already. Thanks!